Rejoice. We are smack dab in the last few weeks of Destiny 2 as we know it. The game's upcoming 1.2.3 update on July 17 will change and add a lot to the existing world. Excitement for the new update and the Forsaken expansion in September has the community all riled up. In a good way. 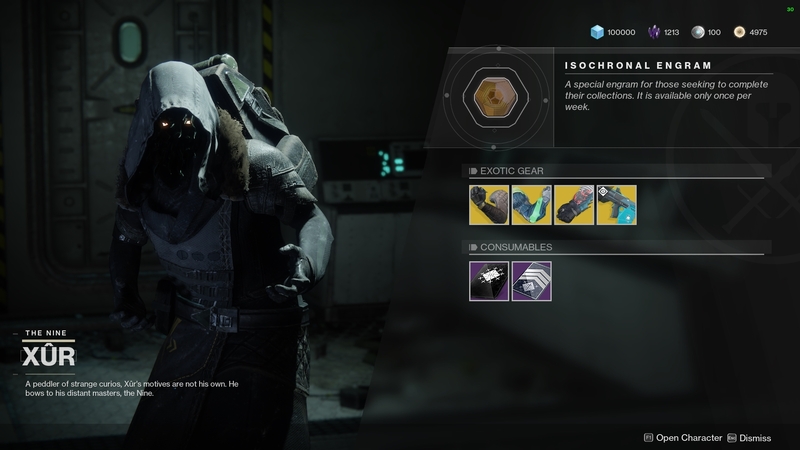 For now, Xur is still making his rounds each weekend with a selection of Exotics for you to peruse and purchase. Let's check out what he's got in store for the weekend of July 6, 2018. 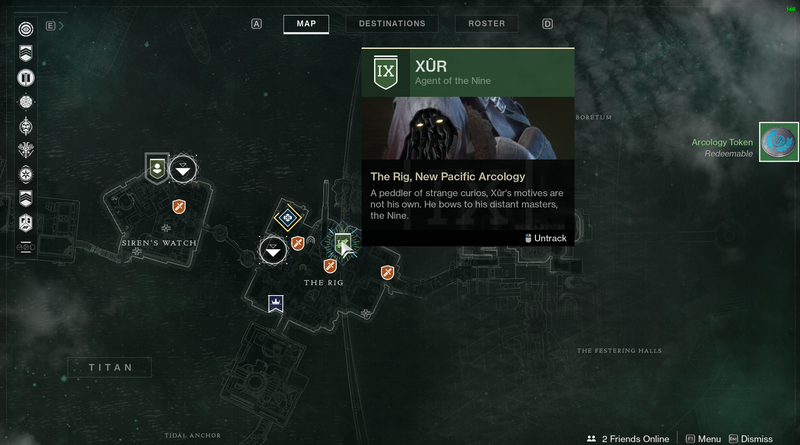 Xur is on Titan, hanging out in his usual spot in the Rig section of the map. He's tucked into the dark corner of a small room inside one of the buildings. This week's weapon is The Jade Rabbit, a returning Exotic from the first Destiny. This awesome looking scout rifle gives you bonus damage on your next precision shot when you chain body shots, and it will return ammo to the magazine. It costs 29 Legendary Shards. As for armor, Xur has gauntlets for each class. For Hunters, he has brought Mechaneer's Tricksleeves. These gloves increase sidearm ready and reload speed, and swapping to a sidearm while critically wounded will increase its damage. They're on sale for 23 Legendary Shards. This week's Titan armor is Synthoceps. These gauntlets are quite strong, as they increase melee lunge range and improve melee and Super damage when you are surrounded. They are excellent in the Crucible, and they only cost 23 Legendary Shards. Karnstein Armlets, Warlock gauntlets, round out this week's stock. These gloves will be getting buffed in the 1.2.3 update, so they are absolutely worth picking up. The Armlets greatly restore health upon melee kills, and they cost 23 Legendary Shards.